TRG Vinyl Dye can renew or change the colour of leather, vinyl, plastic, rubber and many more material. In a simple to use aerosol can, you can simply spray onto your item. Like all our Vinyl Dyes, it is a true dye, not a paint. It seeps into the material and physically bonds with it, changing or renewing the colour. It will not rub off, it will not scratch off and because it binds with the material it repels water, soil and stains. It has been used on car dashboards to completely change the interior, on motorbike fairings, stereo systems, games consoles, leather and faux leather sofas, seats, handbags and shoes. Even material shoes and wedding shoes are a popular item to change, and wellies at Halloween! And of course, vinyl items! See Where To Use Vinyl Dye for more inspiration. See our Project Gallery, where customers have posted images of their projects. Usually a simple 2 step process is required; fully clean and remove any grease from the item, then apply several very fine coats of spray to fully colour the area. Don't forget, whenever using a new product, or a product you're familiar with on a new surface, you should spot test first in an inconspicuous area, and ensure you are fully satisfied with the finish prior to undergoing the entire project. 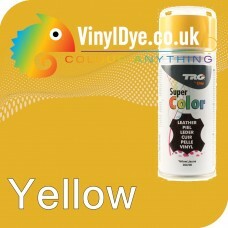 For the best advise on how to use our Vinyl Dye sprays see a very comprehensive guid here; How To Use Vinyl Dye Sprays. For UK and European Customers, simply click the 'Add to Cart' Button, and visit your shopping basket or checkout directly using the links near the top of the page. For other customers, please request an estimated shipping cost using our Contact Us page. See the full range of TRG Colours. See all our Vinyl Dyes. Sometimes you will need Surface Cleaners. Or you can use your own Acetone or similar product. The information given on this website or any publication arising from vinyldye.co.uk is based on our experience and reports from customers. There are many factors outside our control and knowledge which affect the use and performance of our products and for which reason no warranty is given, express or implied. Users should make their own tests to determine the applicability of such information or the suitability of any products for their own particular purposes. Statements concerning the use of the products described herein are not to be construed as recommending the infringement of any patent and no liability for infringement arising out of any such use is to be assumed. What finish will I get? Matt, Satin, Gloss??? Most of the time Vinyl Dye Sprays dry to a finish somewhere between Matt and Satin. Although this does change depending on the object being sprayed. As such we always recommend spot testing to completion to check you're 100% happy with the finish. Want a Matt Finish? Ideal for Car Dashboards and making Vinyl Door Cards have their original finish. Adds extra protection too. Use our Matt Spray that we've tested to be compatible with our Vinyl Dye Sprays here [opens in new window]. Want a High Gloss Finish? Add a super shine to the finish and extra protection. Use our High Gloss Spray that we've tested to be compatible with our Vinyl Dye Sprays here [opens in new window]. Coverage. How many cans will I need? This does vary depending on your from and to colours slightly. For example, if you're going from Black to White, you'll get less coverage just because you'll really want to cover every last part since you'll notice the underlying colour. If you're going from a Beige to White, or from White to Red, it will take less, just because if you miss a part, you won't really notice. So take these guides as a 'worst case' to 'best case' coverage and that should explain the differences. For 1 x 150ml can you'll cover between 1 and 2.5 square meters with 3-5 mist layers to build a complete coat. It's usually enough to cover a single door card to completion, or one side of a car seat. You'll want 2 x 150ml cans to completely cover a car seat to completion in most cases. A 400ml can will cover a lot more. Between 2.5 and 6 square meters with 3-5 mist layers to build a complete coat. 400ml cans are available in a small selection of colours including Black and White click here to see them. Can you send me a colour chart? Yes we can for the TRG branded items. Click here to get a Colour Chart Quick. Can you match a colour? Yes we can certainly tell you the closest colour match. Click here to see The Five Ways To Get Your Colour. Don't forget, Include your email and or moble phone number, we'll email or text you the results and assist any way we can. What's the difference between TRG and Brillo Sprays? There is no real difference between the two. They both perform fantastic results. We only have both brands since sometimes their colours differ, and other times we can supply greater quantities in one compared to the other depending on import delays etc. Full returns details are here; essentially just send back any completely unused items back in a resalable condition within 30 days. You can send items back within 100 days but there are further fees involved. Do you supply a 'brush on' Vinyl Dye? Many customers have this problem and they have resolved it by decanting the spray into a glass jar and then gently dabbing onto the item. In fact. Take a look at the seats here. This is how they did it [opens in new window]. Sorry we don't do anything that's not a spray for vinyl, all our vinyl only products are sprays. For leather we do have the Easy Dye Kits, or if you're simply restoring the colour and not changing it, our Universal Cleaner then Leather Balms are best. See here. 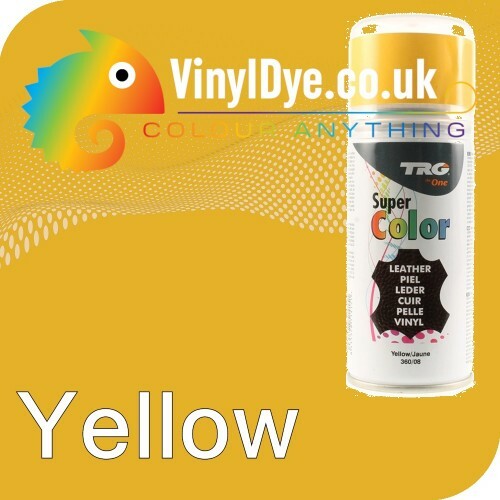 But if it's vinyl, then you will want our vinyl dye sprays, either sprayed on or dabbed many customers are super happy with the transformation they have achieved. They are the only product we have used and tested that consistently work on vinyl and leather, even when flexed. Masking - Can you Mask Areas Off and it look Perfect? Yes. You can use good qulity masking tape and you will achive perfectly clean lines. You can also construct a template to achive the same, many people have done just this. Tip: You'll need to leave the dye to dry for 24 hours if you are applying masking tape to an already dyed part. i.e. putting the tape onwet spray. After 24hours you can put tape on a sprayed area and it will not impact the finish at all.